Sursum Corda is a nationwide initiative of the Institute of Christ the King which aims to foster the spiritual lives of young adults. Tomorrow, March 30, it will offer a Lenten day of recollection for Catholic young adults (18-35), at the church of St Brendan, located at 615 S Washington St in Mexico, Missouri. 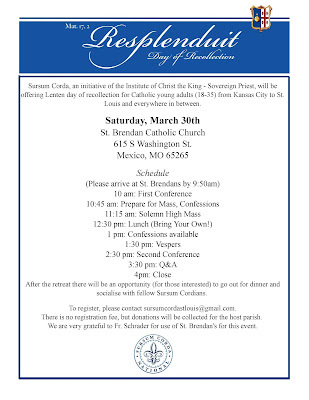 The retreat includes a Solemn Mass of the Lenten feria, First Vespers of Laetare Sunday, spiritual conferences by clergy of the Institute, as well as opportunities for silence, meditation, and confessions. After the retreat concludes, there will also be time for socializing with good Catholic company! There is no cost to attend, but please be sure to bring your own lunch! Please direct any questions to sursumcordastlouis@gmail.com.